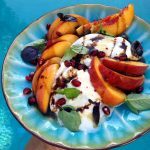 Easy Italian Recipes, Organic Food & Vegetarian Lifestyle Blog! 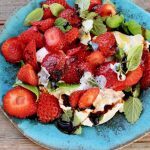 The perfect salad for two made with creamy Italian burrata cheese topped with the sweetest strawberries, fragrant basil and lemon balm then drizzled in a homemade balsamic glaze made with honey and no sugar. 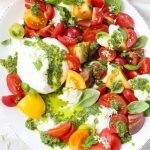 If you aren’t in the mood for burrata, I’ll insist you still make this with a creamy goat cheese instead. That balsamic glaze is absolutely divine over a few other combinations as well. Like tomatoes, cucumbers and feta, think chilled juicy watermelon, arugula (rocket), baby spinach and even grilled chicken. Just keep a close eye on the glaze simmering away, as it is easy to reduce it too much If you walk away from it. In case that happens and you need to thin it out a little, simply whisk in a little lemon or pomegranate juice or even splash of red wine. If you happen to have any glaze leftover just store in the pantry in a small jar with a lid. Drizzle it over burrata bruschetta, peppercorn steak, roasted figs, pizza, salmon, roasted carrots, beets or pan seared scallops. 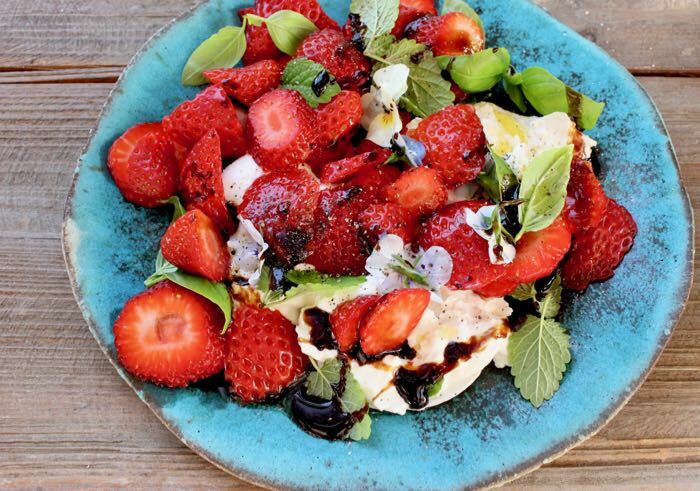 Today it’s all about BURRATA + STRAWBERRIES + BALSAMIC GLAZE! 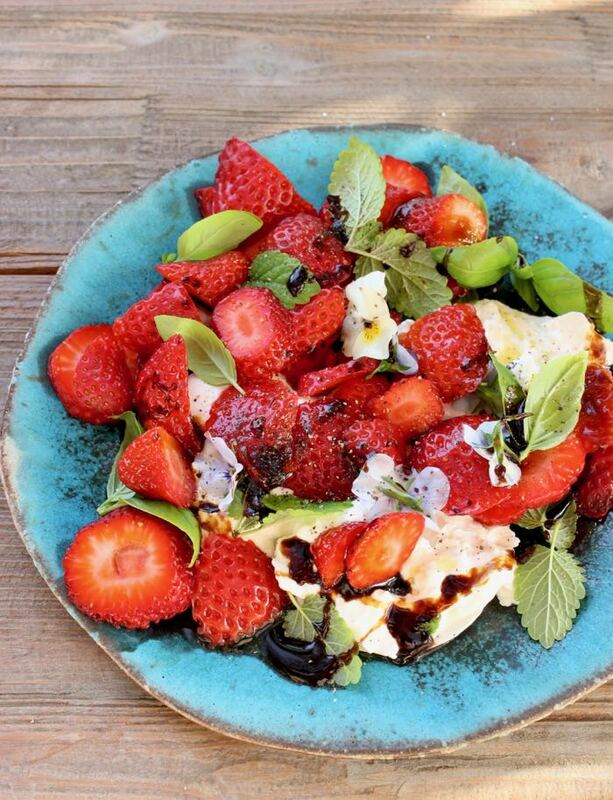 Easy burrata strawberry balsamic salad made with a homemade honey balsamic glaze, fresh basil and lemon balm. Add the balsamic vinegar to a skillet and simmer on low flame. Whisk in the honey and continue cooking until the reduction has reduced by half and has thickened. Make sure it nicely coats the back of a spoon before removing from flame. Allow to cool completely. Use your hands and tear the burrata pouch. 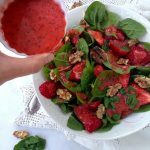 Place on a plate and top with the sliced strawberries. Drizzle with the olive oil and season to taste with a pinch of sea salt and black pepper. Use a spoon and drizzle some of the balsamic glaze over the top. 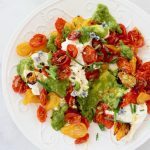 Sprinkle with the fresh herbs and garnish with edible flowers. Hi, I'm Florentina, the voice behind the wholesome recipes you find in this journal. But I'm not alone, I'm really just channeling the Man in the Photo, one recipe at a time! Thank you for joining me in my quest for the art of simple, rustic living, trying to capture the raw beauty of organic food & life through the lens of my Iphone and camera. 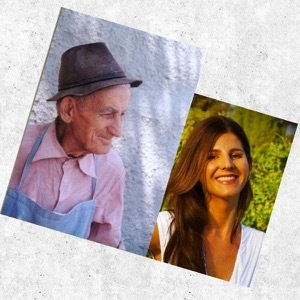 Channeling the Man in the Photo, one recipe at a time, mostly Italian and Vegetarian lifestyle!Please join my quest for the art of simple, rustic living, trying to capture the raw beauty of food & life through the lens of my Iphone - Florentina L.